(Newser) – A Guantanamo Bay inmate who remained in the prison for nearly 14 years finally had his shot at freedom this week—and he turned it down. 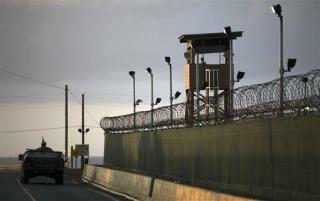 While two other Gitmo prisoners boarded a plane out of Cuba Wednesday morning, Yemen native Mohammed Ali Abdullah Bwazir—who Fox News says is 35 or 36 and had past ties to both al-Qaeda and the Taliban—was depressed and too "frightened" to leave the familiarity of Guantanamo and be sent to a country were he knew no one, his lawyer, John Chandler, tells the New York Times. "I cannot discuss the details of Mr. Bwazir's decision other than to say that, yes, he declined to accept an offer for resettlement in a third country," the chief of staff for the State Department office looking to close Gitmo tells the Times. Bwazir had indicated as late as Tuesday night that he'd leave the prison, but he changed his mind, and now that chance is gone, Chandler tells the Times. This is what they call being institutionalized. Better living than anything in their own countries..I bet obimbo will invite him to live in America with an opportunity to kill Americans. This isn't too unusual when one of the two major political parties for a country considers concepts like 'guilt before innocence' or even 'mercy' to be anathema. Worse, they drag people from the other political party or who are unaffiliated into that kind of mindset too. This is embarrassing for everybody, and tragic for those men that did not warrant maltreatment of this magnitude.